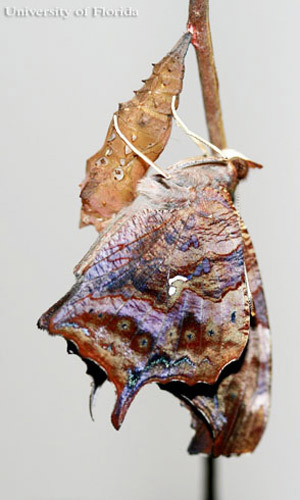 Species in the genus Polygonia are referred to collectively as the anglewings. 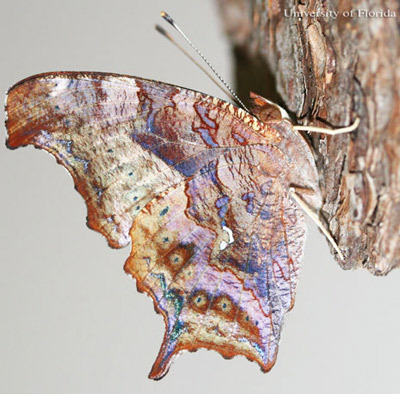 The genus name, Polygonia, is derived from the Greek word for "many angles" and refers to the outlines of the wings. The question mark, Polygonia interrogationis (Fabricius), is a common, medium-sized butterfly of wooded areas and suburbs that is often, but not always, associated with moist areas. 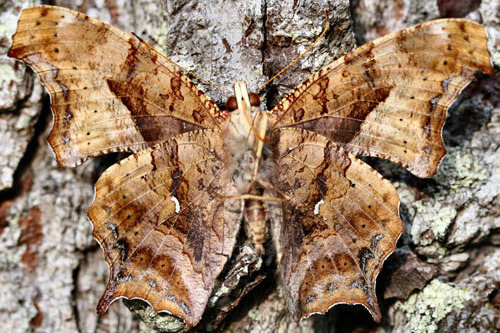 With its wings folded, it resembles a dead leaf and is highly cryptic. Figure 1. Newly emerged adult of the question mark, Polygonia interrogationis (Fabricius), with wings fully expanded and closed. Photograph by Donald Hall, University of Florida. The question mark is found throughout most of the eastern U.S. and southern Canada, south to north central Florida and the northern Gulf states, and west to Arizona, eastern Wyoming and Colorado (Minno et al. 2005, Opler & Krizek 1984, Opler et al 2009). It also occurs into central Mexico (Scott 1986). Adults: The wing spread of adults is 5.2–6.4 centimeters (approximately 2.0–2.5 inches) (Minno & Minno 1999). The margins of the wings are powdery white. The upper surface of the front wings is orange with dark spots. As with the comma, there are two color forms that generally correlate with the "summer" and "winter" adult generations. The upper side of the hind wings is predominantly black in the summer form and mostly orange in the winter generation (Glassberg et al 2000). 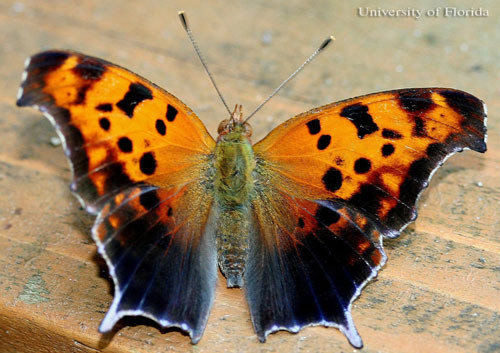 The question mark can be differentiated from the closely related eastern comma (Polygonia comma [Harris]) by the silvery "question mark" in the middle of the hind wing, its larger size, the more strongly hooked forewing margin, and longer hind wing tail. The "dot" of the "question mark" is occasionally reduced or absent. Figure 2. Preadult of the question mark, Polygonia interrogationis (Fabricius). Photograph by Donald Hall, University of Florida. Figure 3. Newly emerged adult of the question mark, Polygonia interrogationis (Fabricius), resting on pupal skin. Photograph by Donald Hall, University of Florida. Figure 4. Newly emerged summer form adult of the question mark, Polygonia interrogationis (Fabricius). Photograph by Donald Hall, University of Florida. Figure 5. An adult of the question mark, Polygonia interrogationis (Fabricius), showing underside of wings of specimen with question mark "dot" reduced on left hind wing and absent on right hind wing. Photograph by Donald Hall, University of Florida. Eggs: The eggs are green and sculpted with vertical ridges. They are identical in appearance to the eggs of the eastern comma, Polygonia comma (Harris). 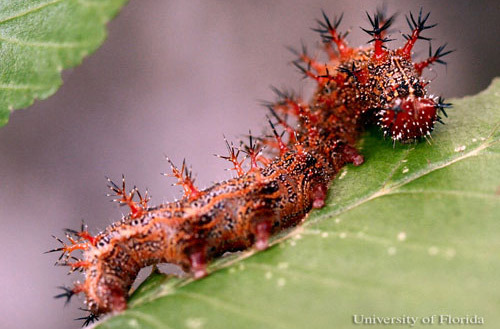 Larvae: Full grown larvae range to 1.4 inches in length (Minno et al. 2005). 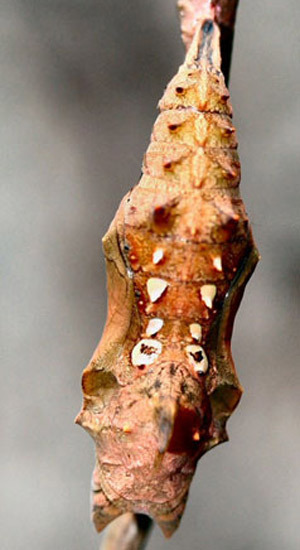 The head is reddish-brown and has short spines and a pair of branching spines on top. The body color is black with variable white or yellowish lines and spots and rows of branched spines (scoli). In some larvae, the lines and spots obscure much of the black background to make the larvae appear yellowish. The spines range in color from yellow and orange to black (Minno et al. 2005). Figure 6. 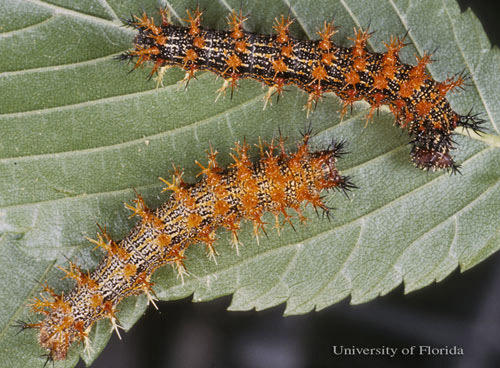 Larvae of the question mark, Polygonia interrogationis (Fabricius), showing variation in body and spine color. Photograph by Jerry Butler, University of Florida. Figure 7. Larva of the question mark, Polygonia interrogationis (Fabricius), larva with black-tipped, reddish spines. Photograph by Donald Hall, University of Florida. Figure 8. 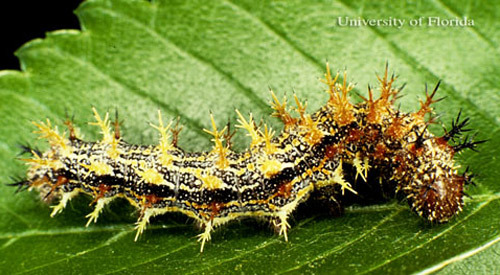 Larva of the question mark, Polygonia interrogationis (Fabricius), larva with black-tipped, yellow spines. Photograph by Donald Hall, University of Florida. Pupae: Pupae vary in color from tan to dark brown. On the dorsal aspect they have a prominent keel on the thorax and two rows of four silvery-white spots, and a double row of points with reddish tips on the abdominal segments. The pupae are attached to a silk pad by the cremaster. Figure 9. 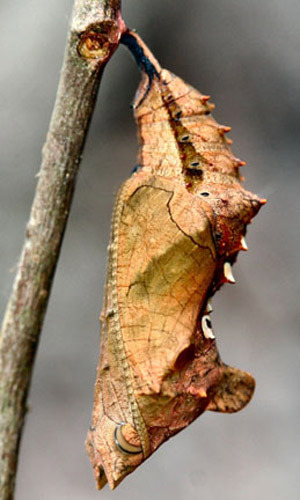 Side view of a pupa of the question mark, Polygonia interrogationis (Fabricius). Photograph by Donald Hall, University of Florida. Figure 10. 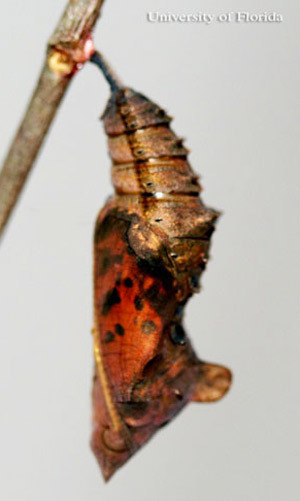 Dorsal view of a pupa of the question mark, Polygonia interrogationis (Fabricius). Photograph by Donald Hall, University of Florida. Eggs are laid singly or in stacks on the undersides of new leaves of the host plant (Minno & Minno 1999) or on a nearby non-host (Cech & Tudor 2005, Opler et al 2009) Larvae are not gregarious and do not make leaf nests. There are two generations per year, with the summer brood probably estivating (a state of summer dormancy) for part of the summer as adults and the fall-winter brood overwintering as adults (Opler et al. 2009). Some adults of the winter brood migrate south during the fall and north during the spring (Cech & Tudor 2005, Opler et al. 2009). Adults feed on fermenting fruit, tree sap, dung, carrion and rarely flowers (Opler and Krizek 1984, Scott 1986). When engorged on fermenting fruit, adults often appear to be intoxicated and are reluctant to fly even when touched (Personal observation, Cech & Tudor 2005). Males perch in the sun on foliage or tree trunks and fly out to defend territories and meet females, and occasionally, to chase other insects or even birds (Hendricks 1974, Opler and Krizek 1984, Opler et al 2009). In addition to the generalist predators that prey on Lepidoptera larvae, there are at least six tachinid fly parasitoids (Arnaud 1978) and at least five hymenopterous parasitoids Krombein et al. 1978) listed from Polygonia interrogationis larvae. 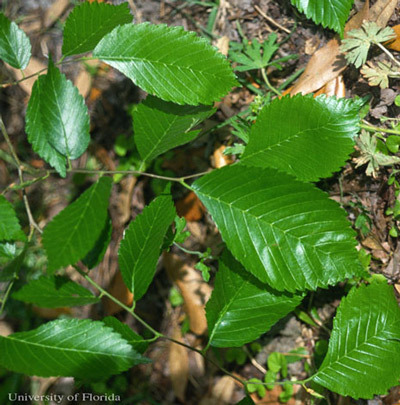 American elm, Ulmus Americana L.
winged elm, Ulmus alata, Michx. Figure 11. 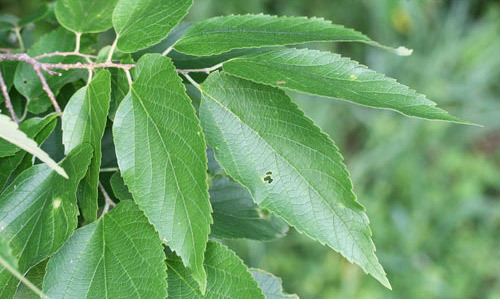 American elm, Ulmus americana L., a host of the question mark, Polygonia interrogationis (Fabricius). Photograph by Donald Hall, University of Florida. Figure 12. Winged elm, Ulmus alata, Michx., a host of the question mark, Polygonia interrogationis (Fabricius). Photograph by Donald Hall, University of Florida. Figure 13. Hackberry, Celtis occidentalis L., a host of the question mark, Polygonia interrogationis (Fabricius). Photograph by Donald Hall, University of Florida. Figure 14. Sugarberry, Celtis laevigata Willd., a host of the question mark, Polygonia interrogationis (Fabricius). Photograph by Donald Hall, University of Florida. Figure 15. 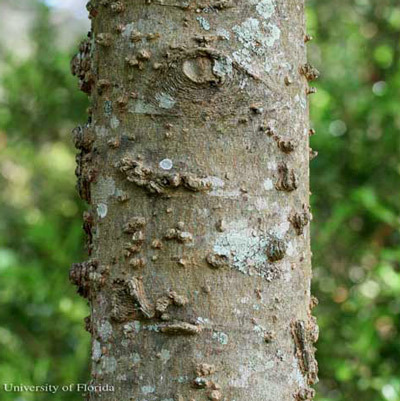 Warty trunk of sugarberry, Celtis laevigata Willd., a host of the question mark, Polygonia interrogationis (Fabricius). Photograph by Donald Hall, University of Florida. 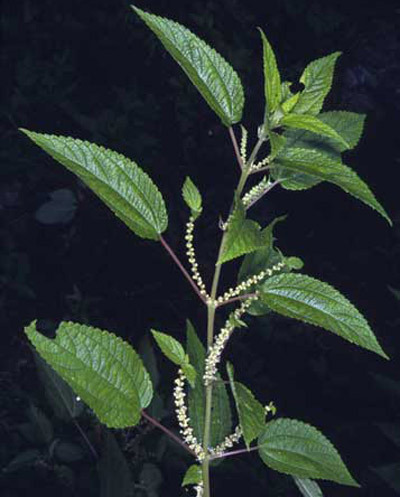 false nettle, Boehmeria cylindrica [L.] Sw.
stinging nettle, Urtica dioica L.
(Scott 1986). Plant names are from Wunderlin and Hansen (2003 or 2008). Figure 16. False nettle, Boehmeria cylindrica (L.) Sw., a host of the question mark, Polygonia interrogationis (Fabricius). Photograph by Donald Hall, University of Florida. Hendricks DP. 1974. 'Attacks' by Polygonia interrogationis (Nymphalidae) on chimney swifts and insects. Journal of the Lepidopterists Society 28: 236. Opler, PA, Lotts K, Naberhaus T. (2009). Question Mark, Polygonia interrogationis (Fabricius, 1798). Butterflies and Moths of North America. (11 September 2014). Wunderlin RP, Hansen BF. (2008). 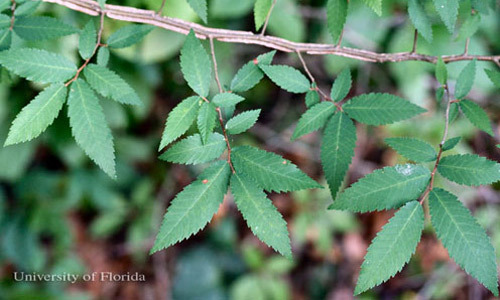 Atlas of Florida Vascular Plants. 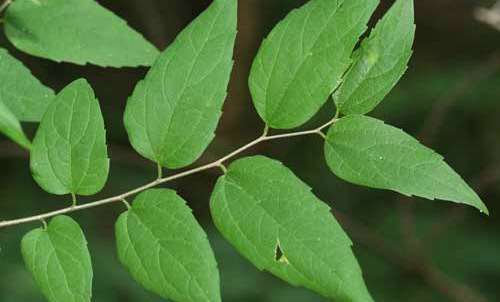 Plantatlas.org. (11 September 2014). Publication Date: October 2011. Latest Revision: September 2014.